From the time of the French Revolution in 1789 through the reign of King Louis-Philippe and the establishment of the Second Empire in 1852, an incredible concentration of artistic talent brought its collective skill to bear on one of the most turbulent times in French history. This exhibition features some of the greatest examples of works on paper of the period from Paris's famed Musée du Louvre. Included are eighty drawings by such noted artists as David, Prud'hon, Ingres, Géricault, Delacroix, and Corot. David, Delacroix, and Revolutionary France: Drawings from the Louvre is organized by Louis-Antoine Prat, Curator in the Department of Graphic Arts at the Musée du Louvre and Jennifer Tonkovich, Curator in the Department of Drawings and Prints at the Morgan Library & Museum, with the assistance of Esther Bell, Moore Curatorial Fellow, the Morgan Library & Museum. The Morgan acknowledges the exceptional collaboration of the Musée du Louvre, Paris, and the support of the Musée d'Orsay, Paris. This exhibition is made possible by a major gift from Karen H. Bechtel. Generous support is provided by the Alex Gordon Fund for Exhibitions, the Robert Lehman Foundation, Inc., Karen B. Cohen, Wildenstein & Co., Inc., the National Endowment for the Arts, and The Grand Marnier Foundation, with additional assistance from Patrick and Elizabeth Gerschel. The catalogue is generously underwritten by the Joseph F. McCrindle Foundation. 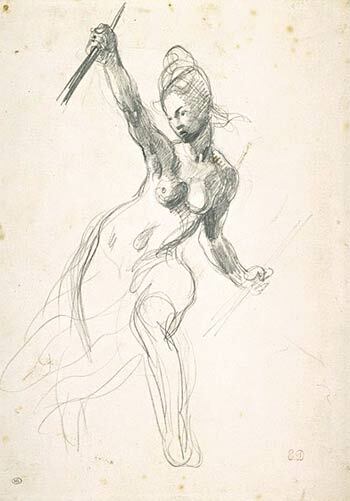 Eugène Delacroix (1798–1863), Study for Liberty Leading the People, Graphite lightly heightened with white chalk, on wove paper. Réunion des Musées Nationaux / Art Resource, NY Photo: Thierry Le Mage.